ARC'TERYX Alpha FL 45 Backpack. The Arc'teryx attention to performance details, focus on delivering maximum functionality with minimalist design, and unrivaled commitment to craftsmanship combine in a fast, light, hardwearing pack for climbers and ski alpinists. It begins with the materials. Highly weather resistant, light in weight, and designed for the rigors of ice and granite, the N400-AC2 pack fabric is coated inside and out to create an air and water impermeable fabric that resists almost any weather condition and is very resistant to abrasion. A comfortable carry is key. The Alpha SL 45 uses an HD 80 foam back panel to provide support, structure and padding. The efficient suspension system offers load support for minimal weight. Unique thermoformed shoulder straps combine the N400r-AC2 nylon 6 ripstop, Burly Double Weave fabric and HyPUR-cel foam. The result is an air permeable strap that provides comfort and minimizes irritation, yet is surprisingly light in weight. A simple 40mm webbing belt helps minimize sway while navigating technical routes. The pack weighs a mere 670 grams (23.6 ounces) and is optimized to work with other Arc'teryx Ascent products to deliver an ultrafast, ultralight alpine system ready for the harshest conditions. Moving fast still requires carrying the essentials. The 45L capacity provides enough volume for a long day's ski or a minimalist's multi-day trip. Instead of the traditional lid, a combination drawstring and RollTop closures are employed. This design reduces weight by eliminating the top lid that is generally shoved inside when on route, improves speed and accessibility to the main compartment, and allows users to increase or decrease pack volume as necessary. 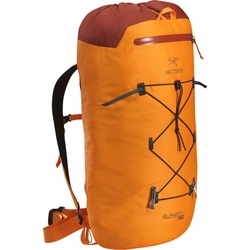 When not needed, the RollTop tucks into the pack and out of the way, leaving the drawstring collar to seal the pack. Lash points on the front and each side help carry skis or a sleeping pad, and the bungee attachment holds crampons, ice tools, or can stash a jacket for quick access when the weather turns. Two loops at the top permit the pack to be hauled, and a top strap secures a rope. Every gram counts, so there are no extraneous features or construction elements. Even the seam tape is stripped down to a scant 15mm wide.